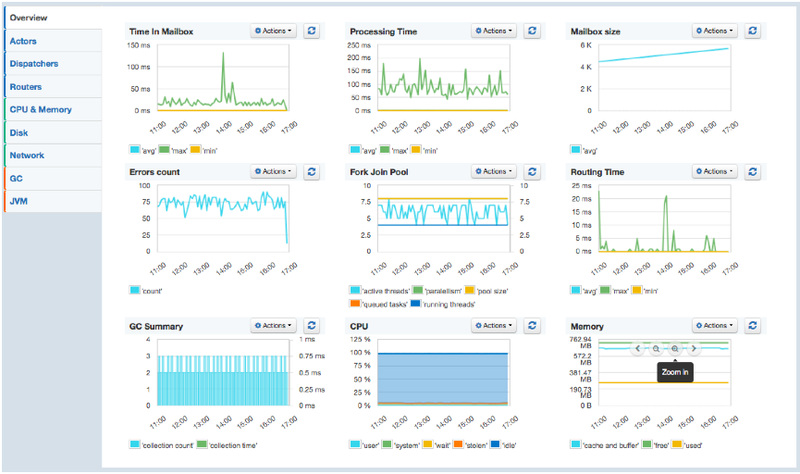 Want to learn more about Akka monitoring? Here's a great write up on Akka basics. Messages between Actors are exchanged in Mailbox queues and Dispatcher provides various concurrency models, while Routers manage the message flow between Actors. That’s quite a lot Akka is doing for developers! But how does one find bottlenecks in distributed Akka applications? Well, many Akka users already use the great Kamon Open-Source Monitoring Tool, which makes it easy to collect Akka metrics. However — and this is important! — predefined visualizations, dashboards, anomaly detection, alerts and role-based access controls for the DevOps team are out of scope for Kamon, which is focused on metrics collection only. To overcome this challenge, Kamon’s design makes it possible to integrate Kamon with other monitoring tools. Needless to say, Sematext has embraced this philosophy and contributed the Kamon backend to SPM. 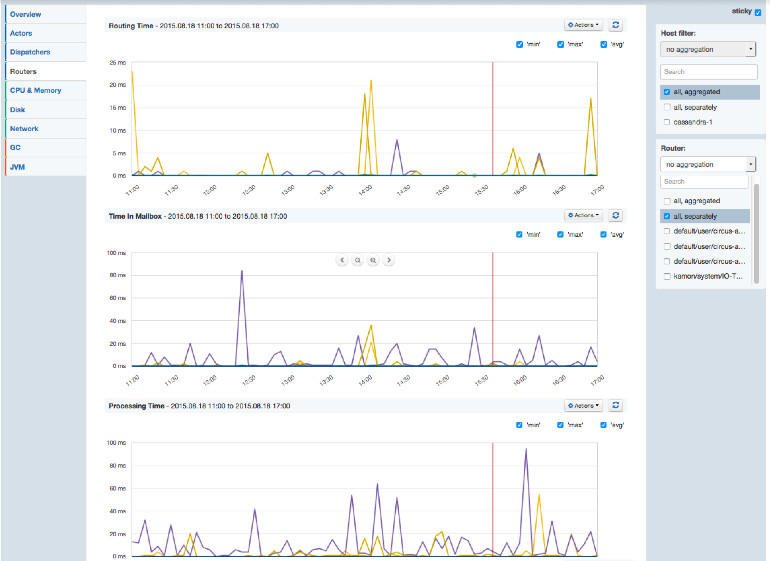 This gives Akka users the option to use detailed Metrics from Kamon along with the visualization, alerting, anomaly detection, and team collaboration functionalities offered by SPM. 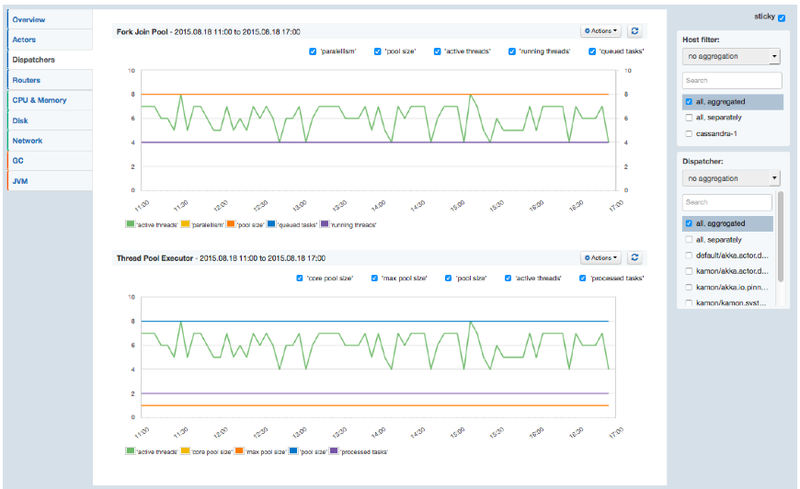 A single SPM App can take metrics from multiple hosts to monitor a whole cluster; filters by Host, Actor, Dispatcher, and Router make it easy to drill down to the relevant piece of information. Messages are waiting to be processed in the Mailbox – high Time in Mailbox values indicate potential delays in processing. Large Mailbox Size could indicate pending operations, e.g. when it is constantly growing. Each of the above metrics is presented in aggregate for all Actors, but one can also use SPM filtering feature to view all Actors’ metrics separately or select one or more specific Actors and visualize only their metrics. Filtering by Host is also possible, as show below. All metrics can be filtered by Host and Dispatcher. Routers can be used to efficiently route messages to destination Actors, called Routees. Time In Mailbox – Time spent in routees mailbox. For all these metrics, lower values are better, of course. 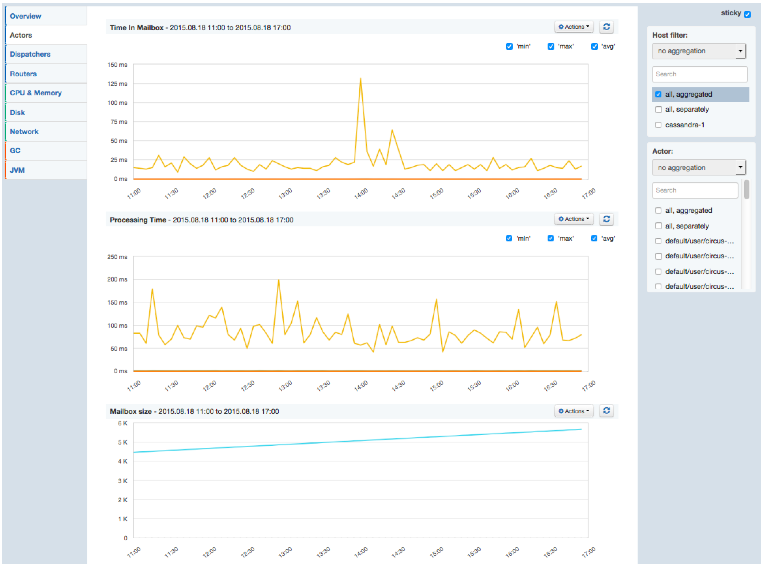 You can set Alerts and enable Anomaly Detection for any Akka or OS metrics you see in SPM and you can create custom Dashboards with any combination of charts, whether from your Akka apps or other apps monitored by SPM. We hope you like this new addition to SPM. Got ideas how we could make it more useful for you? Let us know via comments, email, or @sematext. Published at DZone with permission of Mick Emmett , DZone MVB. See the original article here.